As Yosemite Park Turns 150, Charms And Challenges Endure In 1864, Abraham Lincoln set aside the nation's first federally-protected wilderness areas. Visitors have enjoyed Yosemite's wonders ever since — sometimes to the point of endangering them. 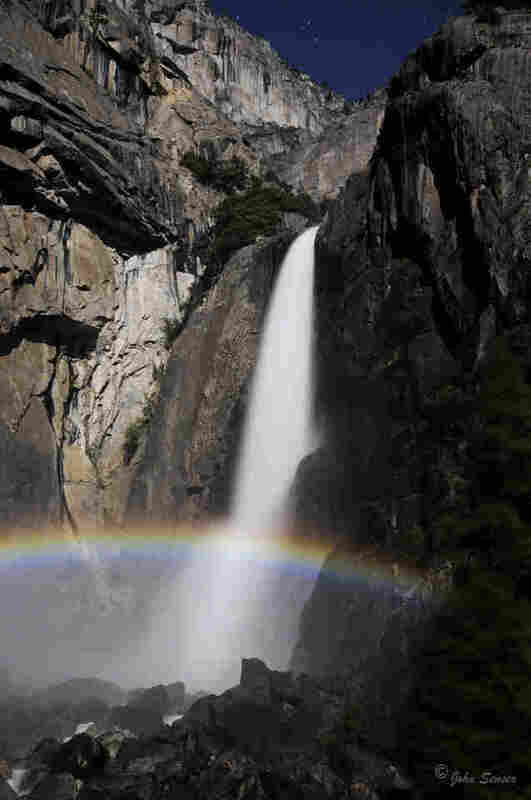 The moonbow at Yosemite Falls is only visible when the moon hits the mist at the base in the right way. Some photographers time their visits to the park to capture the rainbow's colors with a long exposure. Yosemite National Park, in California's Sierra Nevada, is celebrating the 150th anniversary of the law that preserved it — and planted the seeds for the National Park system. At the same time, the park faces the challenge of protecting the natural wonders from their own popularity. Since President Abraham Lincoln signed the 1864 law that protected this land, visitors have been enjoying the park's spectacular features, from Half Dome to the giant sequoia grove — and the moonbow at Yosemite Falls. The moonbow is like a rainbow, but at night. Some photographers time their visits to the park so they can catch a glimpse of this rare phenomenon, which is only visible when the moonlight catches the mist at the waterfall. Four million people visit the park each year. Photographer Mark Zborowski, who's here to capture the moonbow, is among them. He explains that the naked eye just sees a thin silvery band, but a long exposure with a camera can capture the moonbow's color. The entire scene is "just a spectacular view," Zborowski says. "You look up, and you can see the ridges up high, and the stars," he says. "It fills your eyes — gives you a lot to feed off of." Photography has been key to Yosemite's allure. Historians think it may have helped convince Lincoln to preserve a place he'd never visited. Today you can still see some of the sites that appealed to those early photographers. Ranger and park historian Dean Shenk points out one of Yosemite's most famous trees, The Grizzly Giant — which he says is close in size to the Leaning Tower of Pisa. "The first photographer who came to the Mariposa Grove in 1859 took a picture of the Grizzly Giant from the angle that we're looking at today," Shenk says. This grove of giant sequoias, together with Yosemite's iconic valley, became the first federally protected wilderness areas on June 30, 1864, when Lincoln signed the Yosemite Land Grant. "In the midst of our country's civil war, with all the bloodshed, all the battle, all the anxiety," Shenk says, "many of us would like to think that he took a moment and perhaps shook his head, or smiled, in just perhaps a sigh of pleasure." Shenk compares the idea of protecting these lands to the seed of a giant sequoia, which is as tiny as an oat flake. "That seed planted by Lincoln's signature has expanded to the National Park System throughout America," he says. But even those who urged Congress and Lincoln to preserve Yosemite warned that tourism had to be managed carefully, Shenk says. That includes Frederick Law Olmsted, the landscape architect who helped design New York's Central Park and helped oversee the Yosemite land grant. "Not only did he predict the millions of people in the future, but he also said ... 'We must be aware of the capricious damage that one visitor might make, and then multiply it by the millions,' " Shenk says. Helen Hogan Coats and her husband Jack live along the highway heading into Yosemite. Coats worked at the park hotel and babysat for Ansel Adams, witnessing the park's many changes. Helen Hogan Coats, who was born in Yosemite in 1927, has witnessed the changes caused by visitors. 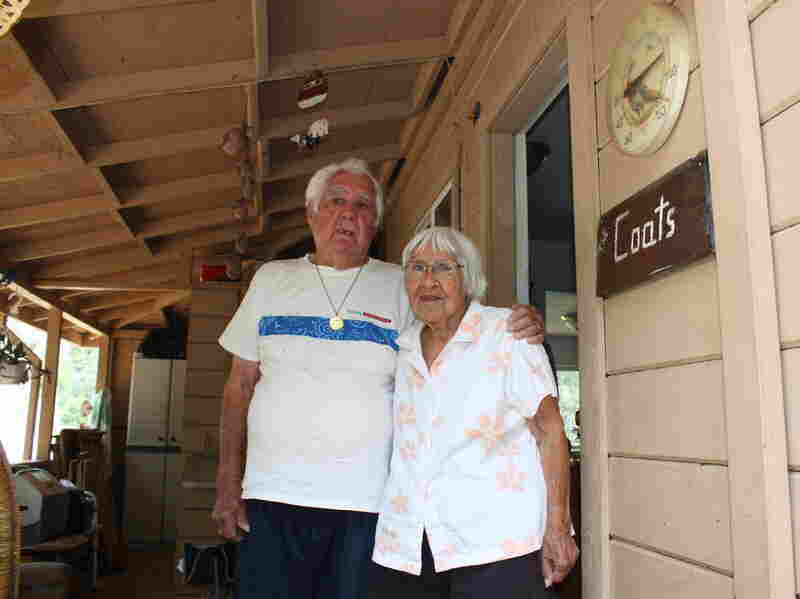 She's one of the oldest surviving Native Americans to grow up in the park. "I live right here on the highway that goes to Yosemite, so I see these buses go and go," Coats says. "I tell my husband, 'There they go again. They're trompling down my ground again, they're just trompling her down.' I said, 'Why don't they give her a rest? They're making it into a Disneyland.' "
Coats worked in the hotel laundry washing sheets, and babysat the children of Ansel Adams, the famed Yosemite photographer. She says she hopes visitors coming to commemorate Yosemite's history will stop for a while to think about what this place was like before white settlers arrived a century and a half ago. "Don't just come in there and have a good time celebrating," she says. "You got to have a little spiritual way of looking at the rocks and the trees." Soon, the Mariposa Grove of giant sequoias will be a little less like Disneyland. The trams that snake through the trees on paved roads will soon be removed, as will the parking lots built right on top of some of the sequoia' delicate roots — and the gift shop. National park officials plan to restore the grove as part of the anniversary celebration. Tourists will have to walk through the trees on foot, much as the first visitors to Yosemite did 150 years ago. 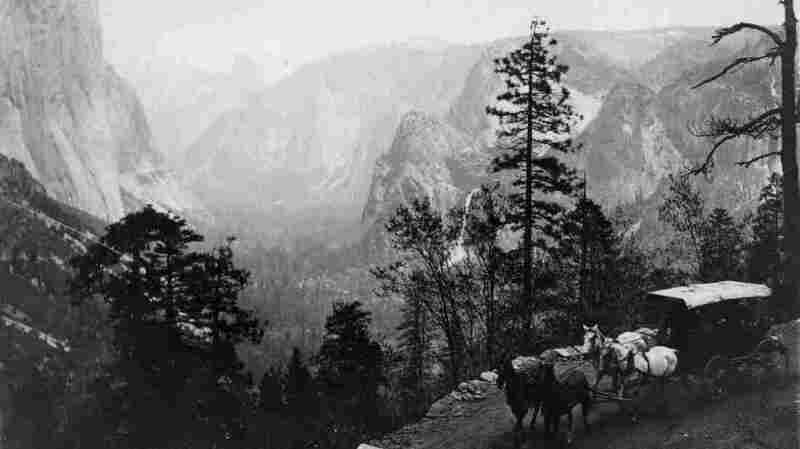 Over the past century and a half, visitors have traveled through Yosemite on foot, by carriage, by tram and by car. Now some regions will be once again be accessible only by foot, to protect delicate regions of the park.